Quickly inflate balls, bike tires and more! 17' PVC air hose with quick-connect valve. 6' power cord for easy and hassle-free connection. Inflate all kinds of high-volume products. Quickly inflates balls, vehicle tires and bicycle tires. Features a 1' rubber air hose and 17' PVC air hose with quick-connect valve and a 6' power cord for easy and hassle-free connection. Includes 4 inflation adaptors for inflating sports balls, beach balls and other high-volume products. Plugs into any standard 120-volt wall outlet. This pump can inflate up to 150 psi. Typical ball pump with easy use nozzles. used for sports equipment inflatable childrens toys. Reasonably priced and works as described. It has been 'protable' in that we can easily take it from program site to program site and quickly inflate what we need. There accessories are great but we find we just use the inflation needle mediocre quality. The other accessories we leave in our main office so we do not lose them. Enough room on the main body of the inflator that we were able to tape a few extra inflation needles. Whether you need to inflate your balls pool float an airbed or a towable tube this High Pressure Air Pump has you covered! The adaptor attaches to any air nozzle to get your inflatables pumped up in no time. Six universal valves are included so you'll be able to handle any type of inflatable. 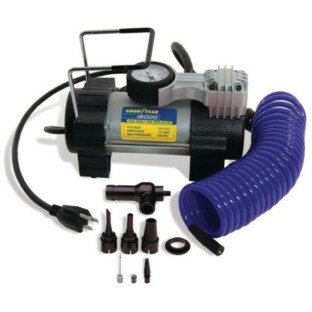 The 12V High Pressure Air Pump features an easy access on/off switch removable pressure release valve and long coiled air hose. Pumping up the P.E balls.